Since of deprecation of Google Earth Web plugin. This service is also unavailable now. A Web application to plot GPX data to Google Earth. Push the File button and choose local GPX file to display track on Google Earth. Please install GoogleEarth Plugin before using. 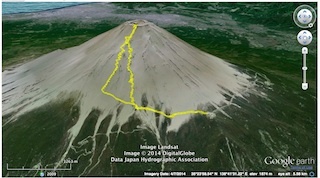 GPX file is processed on local script by using HTML5 FileReader API. Use recent desktop browsers such as Chrome or Safari. Push File button and choose GPX file to display track on Google Earth. When you check the box BEFORE picking a file, Time markers will be shown on every hour. Termination mark has duration time from start. Markers will not displayed when GPX file doesn't have time stamps. When track is shown, Push Play button to move camera along to the track. You can see bird eye's view in a minute. Zoom range and angle are able to change during this mode. 1.1.1:Chaning Zoom Range and angle on Playback Mode had been available. 1.2.0:gpx Query Param had been available. Load GPX from specified URL when the parameter is appended.(Example. ?=gpx=). The server which hosts GPX most have Access-Control-Allow-Origin support.